Best wishes for Katie and the "seat of her pants" writing style. I can relate as this is a common style that many writer's have to go through. Have a great week all! Great interview! I think one book a year would be good for me too. Congrats to Kathryn! Thanks for your comments. I take it you're a plotter? Thanks! I liked Katie's book a lot. She got into the characters' heads and hearts. I love meeting fellow Pansters! Best wishes on the success of this novel. Susan, I LOVE your two-part giveaways! So fun! Katie, hello to a part panster!!! So cool reading about your book!!! One book a year sounds perfect after my attempt right now to do two!!! I always enjoy reading how author become authors. Another good interview Susan. Part II is next week with another two opportunities to win. Thanks for coming out of your writing cave to visit. Hope you're feeling better. I miss your blog posts. I love asking authors all those things we wonder about. I really enjoyed this interview - so glad I popped in from Alisa's blog! Thanks for entering the giveaway. Have a great day! Loved the interview and can't wait to read your book Kathryn. I've just recently become a follower. On my bucket list is to visit all the state capitols in the US...so far I've only been to a handful of some in the western states. Enjoyed the interview. I enjoyed your interview Katie, and looking forward to reading your book. 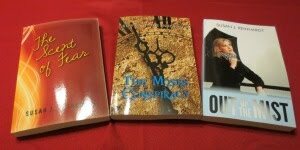 I'm not a blogger, but do enjoy all the Christian book blogs I subscribe to or follow. I love to read, and love finding new authors. Thank you for the entry in your giveaway. I forgot my "bucket list"...one I recently checked off, was to go to the ocean. This past August I was lucky enough to go to Ocean Isles, NC with my daughter and eldest granddaughter, and it was wonderful. My first time to the ocean...what a beautiful place to relax and enjoy all the beauty God created. I hope to do more traveling as health permits. I'd like to visit the Asheville area of North Carolina where I spent 10 summers of my youth. I appreciate you Following via email. Thanks for entering the giveaway. Don't forget to stop by on 11/17 (Wednesday) for Part II of the interview. Thanks for following Christian Writer/Reader Connection. I love traveling in the U.S. What a fun goal to visit all the state capitals. Thanks for entering the giveaway. I hope you'll come back for Part II of the interview and more entries. I'm glad you were able to fulfill your dream of seeing the ocean. A few years back, I got to see the gorgeous Rocky Mountains in Colorado. Thanks for stopping by and entering the contest. Oh, I like your bucket list item. It would probably take me forever though because I'd want to tour each area! Great interview! Would love to read this one. Writing a book is on my bucket list as well. I've done a good job of covering most of the rest of my list already! I'm a new follower. Great interview, cant wait to read the rest..ON my bucket list is finish my books. I to have always want to write. I tried when I was home raising my daughters but i went to work. then God decided to throw us a curve ball and we had a baby boy four years ago after my youngest daughter graduated from highschool. So I quit my job and decided this was my time. Its been great. I get to write a lot more now and I get to watch my baby grow up. When he starts kindergarden next year i want to be ready to work on getting published. Welcome to Christian Writer/Reader Connection! Thanks for becoming a Follower and entering the giveaway. I'll try to get over to your blog tonight. I love connecting with other writers. My bucket list also includes finishing my books and getting them published. I'm glad to hear you're ready to accomplish your dream. Thanks for stopping by and entering the giveaway. I post here Monday, Wednesday, and Friday. I'd also like to do some traveling. I love sightseeing, especially in historical areas. I, too, am a SOTP writer, and I've gotten into quite a few corners!! What a beautiful interview. Kathryn, thank you for sharing your heart. I fell in love with your work when I read Leaving Yesterday for review. It was simply beautifully written. What is on my bucket list? I don't think I really have one. I have just learned through many trials to just live each day as there is no tomorrow. To enjoy each moment and smile at the joys from the Lord. I am a follower and so enjoy your blog! !